When starting my food blog about a year ago, little did I think about all the things that actually blogging involved. I kind of thought: set up a page, take pictures of your food and post about 2 or 3 times a week. Everything else was a mystery. I had no idea about Photoshop or actually taking pictures, didn’t know what traffic was or page views and so on. I actually only started this because I love food and cooking and after discovering food blogs about 2 years previously I caught myself thinking about blogging myself again and again especially when cooking and eating something that I really loved. What I also completely ignored about blogging was the community I was going to be a part of once I started blogging and once I actually started realizing that there is a community out there (believe me, it took me some time to get that!). Little by little the blogging world starts to reveal its secrets to me. It is hard work and things are still rather blurry but I hope I will be getting there someday, to the point where I can say that I actually know what I am doing here. A new step in this direction is The Casual Veggie. The offer to be a part of the team putting together the recipes included in the book came completely out of the blue. I didn’t know Mollie and her blog, so this took me quite by surprise. I cannot tell how thrilled I was about it, being part of something like this, I feel this to be the first major thing for me since starting blogging. A lot of good things happened along the way, but this one has to be the best until now. 166 recipes to help you find your way on the road to healthy eating. Nowadays not an easy thing to do as I found out myself along the years. Although when thinking about it, I have to admit that at least I had a good start. I grew up in the communist 80’s and post-communist 90’s in Romania. There are not so many positive things one can tell about these times in Romania. In the 80’s we had the money but there was nothing one can spend it on and afterward, in the 90’s, we had plenty of products but nothing to buy it with. But one thing positive was our diet, in my opinion thousand times healthier than the average Romanian diet today. We ate meat but mostly from the pigs and chickens that grew up in our backyard (well, my grandma and I lived in a town but there were other people raising animals around us for this purpose) and we ate vegetables that grew in our garden or were sold by peasants at the huge and amazing markets all around town. No antibiotics, no pesticides, the tomatoes tasted sweet and biting in a scallion at breakfast was absolutely normal even for a small child. We didn’t know things like corn flakes, fast food or ready meals, we barely had any access to sweets or to fizzy drinks and that was good. There were barely overweight people in Romania in those days and I could have counted on one hand the cases of cancer I have heard of during my childhood and teenage years. Things have changed dramatically during the past decade and, in my opinion, the main reason in this change is the change in diet.Fast food and fizzy drinks are a daily business for many people, an excess of meat and most of all processed meats is something you meet in most families and the fresh veggies on the market are first of all not as clean as they used to be and are slowly replaced by the convenience of buying whatever and whenever in the supermarkets. So this being said, I really think I had a good start. I couldn’t cook an egg when I left Romania but still would not even consider eating ready meals or buying myself a hamburger when there was nothing else there. I just ate a lot of bread and butter or bread and cheese and when I got tired of that I started to learn how to cook. And what I love cooking best are vegetables. I love the diversity, the freshness and the colors, the endless possibilities. And I love contributing to writing a book where some of these possibilities are featured. There are 29 chapters in the book, each dedicated to a certain veggie, like cabbage or broccoli or the widely and unfairly disregarded kohlrabi. This makes things easier for you when searching for a recipe for a certain kind of vegetable. 48 bloggers contributed to this book with their wonderful recipes. You will find links bringing you to their blogs, and that will give you access to hundreds and hundreds more wonderful recipes. Some of these bloggers focus on paleo, vegan or gluten-free food, some are registered dieticians or nutrition coaches and some are like me: mothers trying to feed their children in the best possible way, bringing them up with a knowledge and fondness towards healthy, tasty and most of all real food. I really hope you decide to have this book, I am sure you will love and use it a lot. I would also like to invite you to the virtual launch party where you can meet all the bloggers who contributed to writing this amazing book. The event will take place on October 5th between 10 pm and 11 pm. You will have the chance to have a sneak peak of The Casual Veggie Cookbook. Happy to meet you through the cookbook. I’m excited for the 19th. See you there! What a different experience with food you had growing up than this Hot Pockets girl 🙂 It’s great that you are passing on your knowledge and delicious recipes to your children and sharing them on this blog for others (like me) to enjoy! I am so happy to get to know you through working on The Casual Veggie, Adina! Your life experience is one I think a lot of bloggers could learn and grow from, and you write very eloquently about it. Not to mention, your food is absolutely mouth-watering! I can’t wait to get to know you more and try some of your recipes! Such an interesting post, Adina. You came into blogging the same way I did – knowing pretty much, nothing about what was involved. But you have a beautiful blog and have come a long ways already. I know it was fun to be a part of this project. Like you, I’ve only been blogging a year too. I still feel so new at it 🙂 Enjoyed reading about your childhood above! Cheers to The Casual Veggie! The blogging community really is unique! 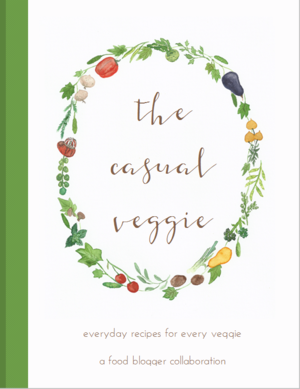 So glad you are a part of it…and so happy you are contributing to the Casual Veggie Cookbook! It is really great, can’t believe I have been (unknowingly) ignoring this for so long. What a beautiful and great idea for a cookbook! I LOVE veggies (had about 1kg per day, crazy, huh?) and include LOTS of them in our meals.. Same here, Tara. 🙂 Thank you. I totally agree – one of the best surprises I got about blogging was the community – it is so incredible the people you get to meet! I am so excited to be a part of the cookbook with you!! Amazing, isn’t it? So many nationalities, so many cultures and ways of cooking, I just love it. And being part of creating a cookbook is just wonderful. So interesting to read your unique story! I’m all about going back to the way we use to eat traditionally. I’m so glad we got to connect through the cookbook! Thank you, Jean. I love reading the stories written by the other contributors as well, so many different approaches to everything. Oh! This is such an awesome idea for a cookbook! I love reading about your childhood. Thanks for sharing this with us. Thank you, Anu. And I love your video! It sounds like a lot of us over in America are trying to figure out how to eat like you did in Romania! I’m so glad we crossed paths when we did! How interesting! I loved reading about growing up in Romania. Thank you for sharing your story. Me too, Nicole. And I think so too.